I’m one of those people who thinks all birds are beautiful, from the drab House Sparrow to the pink Roseate Spoonbill. Yet, there is one bird that looks like a piece of fallen sky as it zips around eating summer insects, one bird whose blue color is so perfect that birders and non-birders alike can’t help but stare. The Mountain Bluebird is one of the most striking birds in the United States, and is the state bird of both Nevada and Idaho. 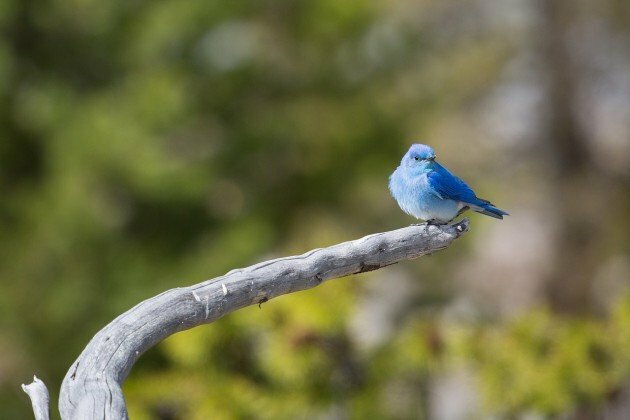 Designated in 1967 (36 years after Idaho’s), the Mountain Bluebird can be found all year round in Nevada, though in general its range shift southward for the winter months; in the summer, this species can be found as far north as Alaska. Though not officially adopted until 1967, the Nevada Federation of Women’s Clubs voted for the Mountain Bluebird all the way back in 1930 and 1931. They let schoolchildren vote too, which must have been a fun class exercise! Historically, Mountain Bluebirds nested in tree cavities created by woodpeckers, but now more commonly choose artificial nest boxes. During breeding months they are usually found in open areas, from sea level all the way up to 12,500 feet. During this period they eat mostly insects, but switch to fruits and seeds in addition to insects during the cooler months. Though these birds look similar to their relatives, the Western and Eastern Bluebirds, the easiest way to tell them apart is through the lack of obvious orange coloring on the Mountain variety. Mountain Bluebird populations initially benefited from clearing land for timber and cattle crazing in the 19th and early 20th centuries, as this led to the open habitat that they prefer. Their numbers have declined slightly as land use shifted, but has now stabilized (especially with the proliferation of artificial nesting boxes). Across the United States, Canada, and Mexico, Partners in Flight estimates that there are 4.6 million breeding birds.